Influence can go a long way in our lives. How we act and think started from our early stages of development. These two things continue to develop as we grew each day and were influenced by the various things we saw and heard about. The person we are now is a result of those influences before and it never really ends. That is why growing up, our parents often would tell us to be friends with who serve as a good influence for us. But since influence goes a long way, it has the possibility to affect our psychological thinking and behavior. A perfect example of this is when a child was constantly embarrassed by the environment he was in and never fully recovered from that kind of experience, he can develop an anxiety disorder as he grows. But how can one fully tell if that is true or even close to the truth? You may also see free assessment templates. It can be identified through a psychosocial assessment. 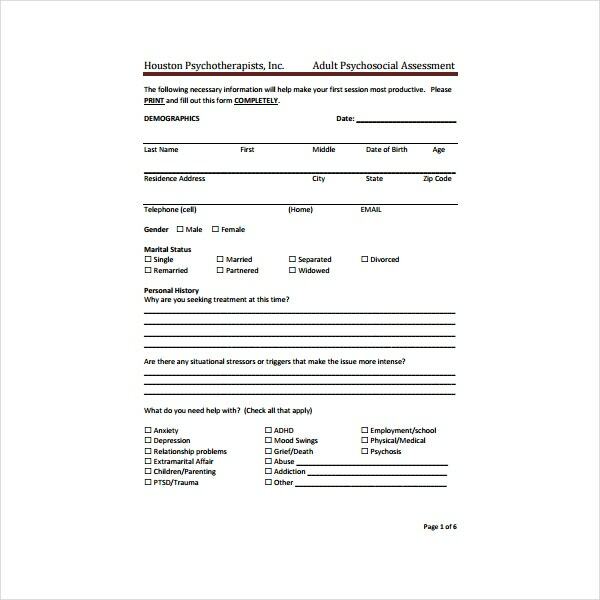 What is a psychosocial assessment you may ask? You will get the answer if you read on and understand the next few parts of this article. 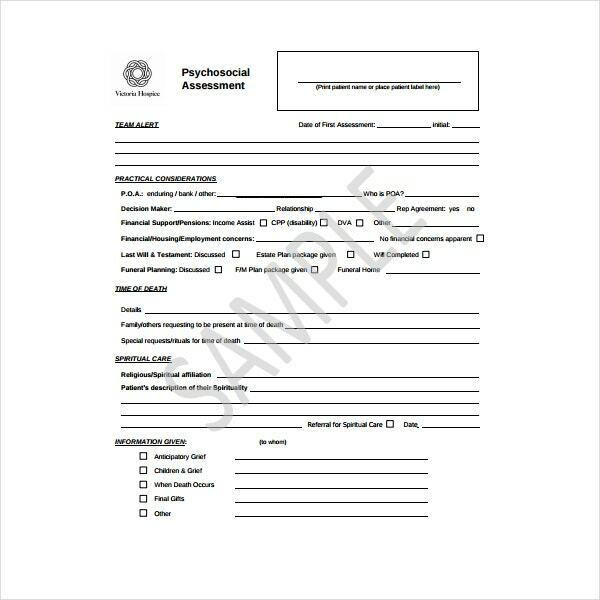 Afterward, we will also state the parts of a psychosocial assessment with templates to guide you in giving you a more comprehensive guide to this kind of assessment. Lastly, we will also mention some common psychosocial diseases during adolescence. So, get a pen and paper and recall your psychology notes. You may also see project assessment templates. Before we explain what the purpose of a psychosocial assessment is, let us first define the term “Psychosocial”. Psychosocial is an approach in which one looks if the behavior and a perception of an individual have greatly been influenced by his/her environment since his/her early stages of growth up until the present time. While assessment is generally understood as the evaluation of the quality of someone or something, assessment can range from the characteristic to performance. So if you put the two together, psychosocial assessment is basically the evaluation of one’s own mental health and social well-being. You may also see security assessment templates. 1. Identify the Patient. This is one of the most basic things one has to fill up in the assessment or in any other personal document. This includes the name, gender, height, weight, civil status, race or ethnicity, languages spoken, address, contact number and birth date. You may also see self-assessment templates. 2. Chief Complaint. This is where the reason will be stated why he/she is being asked to be assessed in the first place. This can include how long he/she has this type of illness or behavior and its signs and symptoms and etc. You may also see best assessment templates. 3. Psychiatric and Psychological History. In this section, this will state all the psychological problems the patient has had. 4. Medical History. This would include the surgical history of the patient or what he/she was prone to being sick as a child up until the present time. 5. Medications. It is important that the nurse or the doctor know what the medications the patient is currently taking and how long it has been since his/her first take. It is also advisable to list how much does he or she take it in a day. You may also see notice of assessments. 6. History of Drug or Alcohol Use. All the alcohol and drugs the patient has taken in the past should be recorded including how it was taken by each of the named drugs or alcohol the patient has stated or remembered. It should also be recorded if there were times that patient had stopped using drugs or drank alcohol and when did it start again and his or her reason why he or she had started to follow that kind of habit again. You may also see assessment schedule templates. 7. Social History. 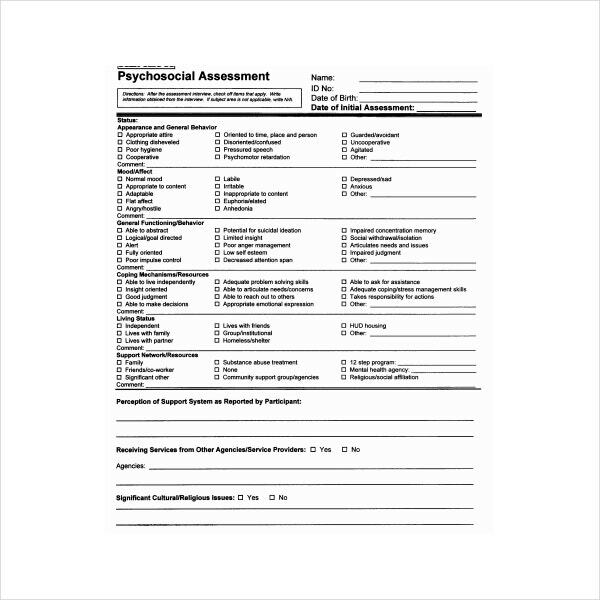 A nurse or the doctor or anyone who is licensed to conduct this kind of psychological assessment on a patient should ask how the patient mingles with others in the past and present. This can lead to the patient sharing if how many of his/her social peers in the past are still part of his/her life and how that fact affects him/her in the present world. 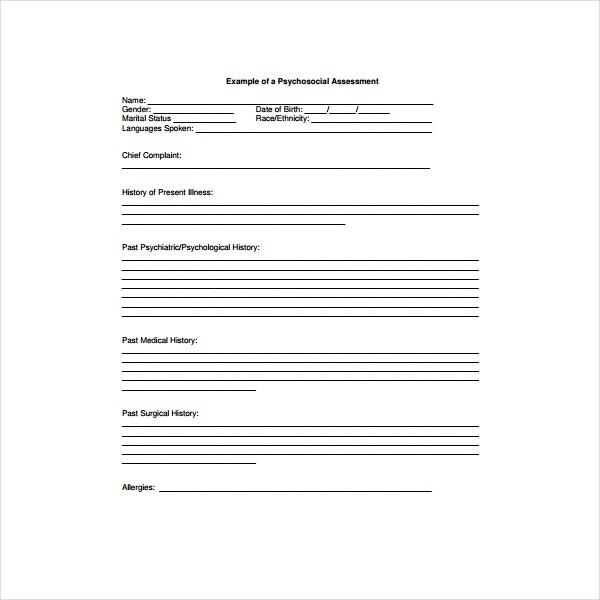 You may also see workplace assessment templates. 8. Family History. The one assessing should ask for the family history of the patient. That includes who his or her mother and father was and what they did for a living. Siblings and significant family members can also be mentioned as long as the patient identifies that specific family member as important to his or her growth since when he or she was in the early stages of childhood. You may also see business performance assessments. 9. Employment History. This is to be concluded so that the one assessing would know if the patient had been to multiple jobs. The one assessing would also as to how was the patient’s social relationships with others in the workforce and why the patient has been through a lot of companies or why has he/she stayed in one company for a long time and does he/she have any plans to make this lifelong. You may also see free needs assessment templates. 10. Education History. By knowing the educational background of the patient, this will guide the assessor on how he or she should approach the patient. 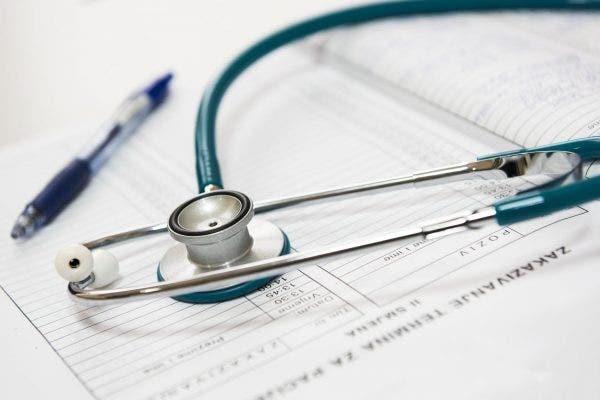 By adapting to the kind of educational background the patient has only gone through, the patient will not have a hard time understanding what the assessor is trying to do and ask him or her. You may also see needs assessment samples. 11. Legal Trouble. This part is important because people who have been through crimes have in a way experience some mental issues in the past and can often lead up to the present time. One serious mental illness can associate a patients murder history. You may also see assessment checklist templates. 12. Developmental History. The assessor should ask if the patient had experienced a traumatic event that might have led up to his/her behavior at the present time and how he/she perceives things. It is also good to ask if that traumatizing experience has affected the way he/she behaved after that incident in the past. You may also see risk assessment templates. 13. Financial Situation. It is important to know the financial status of the patient to see if this part of his/her life might be one of the factors that affect his/her mental state and social behavior in the environment. 14. Coping Skills. The patient should tell the assessor how he/she deals with his/her mental problems so that the assessor would have an idea if the coping skill the patient uses is effective or not. If it is not effective, the assessor can give another set of coping skills to lessen the problems of the patients. You may also see skills assessment templates. These are basically the general terms that are present in a psychosocial assessment form. The one assessing should be a licensed doctor, nurse, psychologist, psychiatrist, a clinical psychologist, psychotherapists. They are the one skilled enough to conduct that kind of assessment since it involves the mental state of the human being. 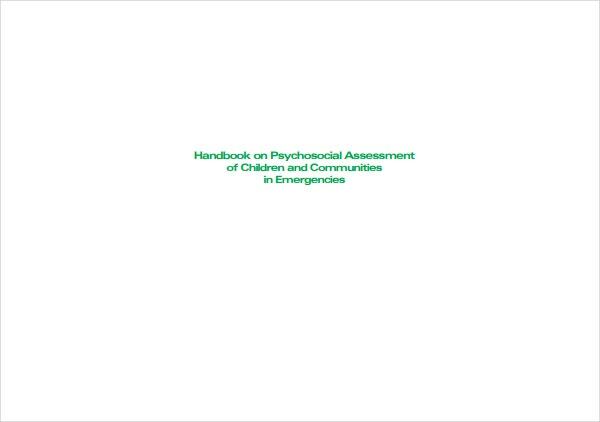 You may also see needs assessment in PDF. Anxiety Disorder. The disorder in which an individual undergoes anxiety and fear on a personal and social level. Anxiety disorder is more severe than the regular anxiety feeling we experience if we are stressed or nervous. Anxiety disorder can hinder one to function properly because the individual would tend to be more avoidant in some situations or environments. Anxiety disorder can be caused by disorders like agoraphobia, social anxiety disorder, selective mutism, panic disorder, phobias, etc. You may also see notice of assessment samples. Depression. This is a major depressive disorder because it can downgrade and affect how we feel, think and act. It has the ability to lose your joy on things you used to enjoy before. This kind of illness can make you feel worthless and guilty in every little mistake you have done. Thoughts of suicide and death are common if one has been diagnosed with depression. You may also see threat assessment templates. Suicidal Ideation. Basically, this is when the individual thinks and imagines planning his/her very own suicide. Although suicidal thoughts often do not lead to suicidal attempts, the risk is still high. It can be caused by other mental illnesses like depression, mood disorder, borderline personality disorder, and anxiety. It can also come from how people around him/her treat him/her. You may also see network assessment templates. Eating Disorder. This is common among the females and can be life-threatening. It is when the female would eat less or do anything to stay slim and fit even if it is through puking what she ate prior. This is due to body insecurities. Anorexia is a common associate of this illness. You may also see assessment calendar templates. Thought Disorder. This is where the individual would have a hard time identifying which is real and which is fantasy. The revelation of the disorganized speech of a person can be caused by the disorganized thought. 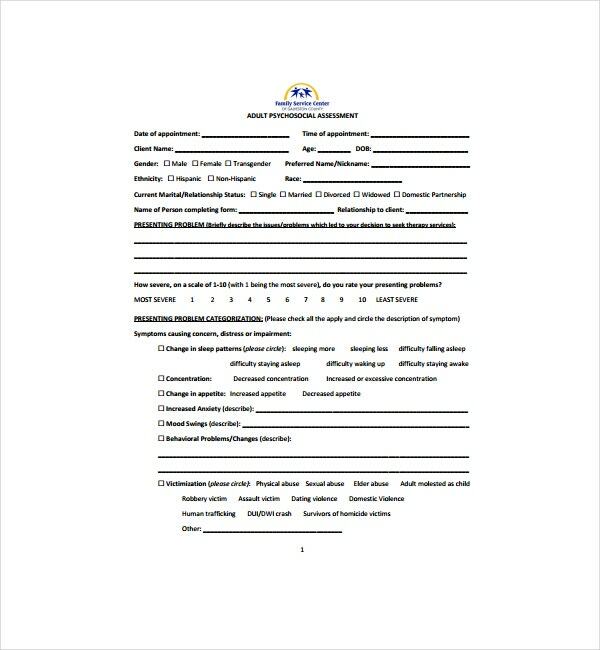 You may also see training assessment forms. So, these are basically the five out of many common mental illnesses or psychosocial problems that adolescents go through. This again would often lead up to the behavior one would display in adulthood and can affect him/her and his/her environment. If one is the assessor, he or she should not manifest actions or say words that might seem to be viewed that you are judging. People with a mental health problem usually do not share their problems with society because of the fear being judged and being misunderstood. That is why it is important for the assessor to be empathic and would know how to listen well so that the patient would be aware that someone is actually making an effort to listen to him or her. 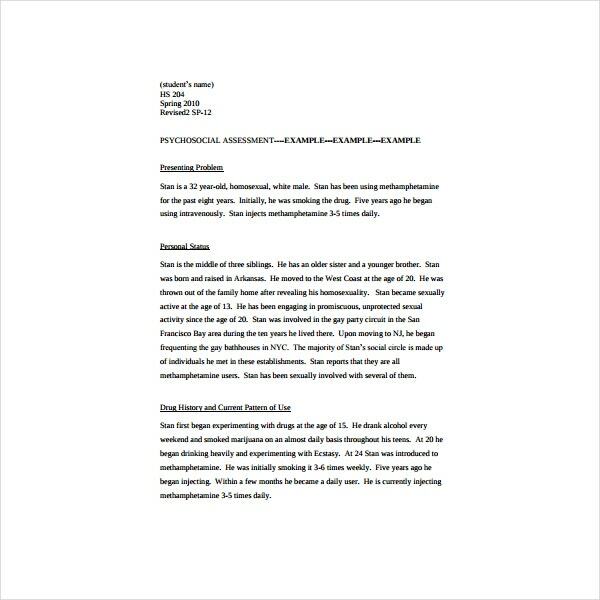 You may also see nursing assessment templates. Always remember that if you are licensed, you have a responsibility and that is to help someone and make them aware of things so that they can also help themselves be well in the end. What could be a better feeling than being able to help someone improve mentally? One way or another, it is also nice if someone thanks you for changing and affecting their lives in a better way. So use the information we have given you to motivate you in becoming an excellent doctor. Remember, it will not only let you get profited because of your title, but you have the opportunity to actually help someone improve in their lives and possibly cure them for good if it is still possible. Lastly, do help with all sincerity to the point that the patient would also feel that from you too. You may also see competency assessment templates.